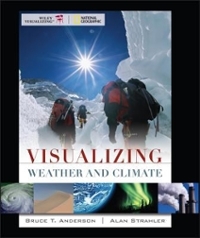 Visualizing Weather and Climate 1 Edition Visualizing Weather and Climate Change will capture the reader's interest in weather and climate and then use that interest to engage them in activities that demonstrate the science that serves as the basis of the discipline. Sections such as Eye on the Atmosphere use beautiful imagery to help them see the atmosphere through the eyes of a meteorologist and ask scientific questions that place significant features in atmospheric context. It also includes expanded coverage of global change and recent phenomena. Chapter summaries, self-tests and critical thinking questions help prepare readers for quizzes and tests while the illustrated case studies offer a wide variety of in-depth examinations that address important issues in the field of environmental science.